For more details and more photos, check out The Judy Room’s Facebook Page where daily “on this day” updates are posted chronicling Judy Garland’s incredibly rich and busy life! 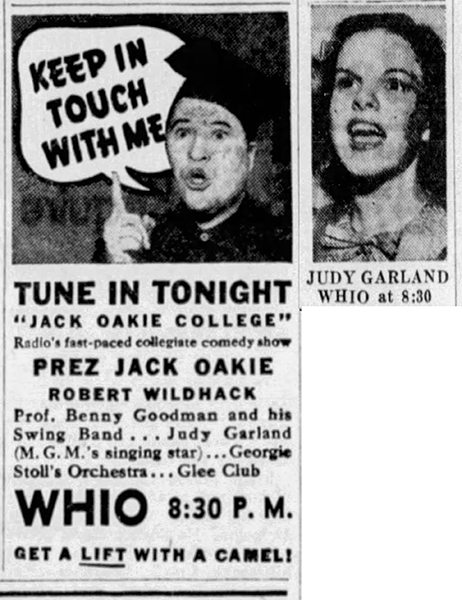 April 27, 1937: Judy’s weekly appearance on the “Jack Oakie’s College” radio show on the CBS Radio Network. Judy sang “Swing High, Swing Low” and “Whispering.” The show also featured Benny Goodman and his Orchestra (out of New York), Georgie Stoll and his Orchestra (in Los Angeles), Robert Wildhack (a comedian who specialized in a “sage of sneezes, snores and other physiological phenomena), and the comedy team of Al Shaw and Sam Lee. No audio is known to exist from this broadcast but a typed transcript of the entire show is available here (PDF). 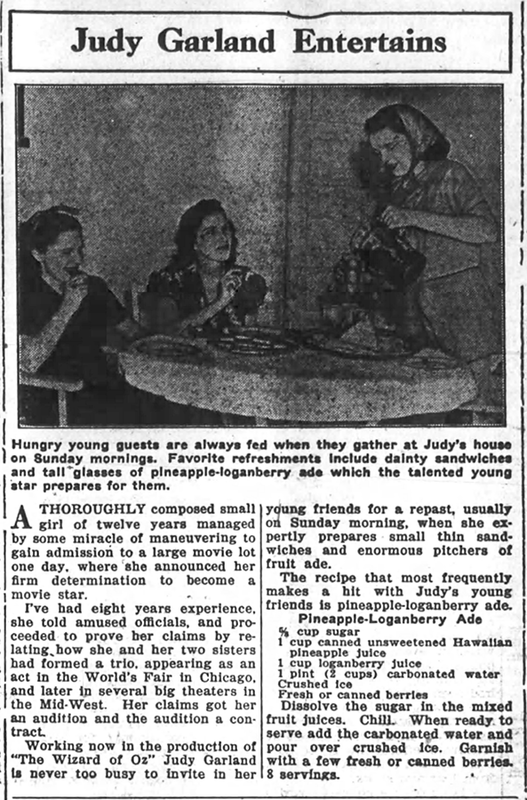 April 27, 1939: This article not only repeated the studio fabricated story of how Judy marched onto the MGM lot and announced she wanted a contract but included a recipe for pineapple-loganberry ade that was attributed to her. The “young guests” in the photo with Judy are actually her sisters Suzanne and Virginia. Even though the recipe most likely wasn’t Judy’s, she probably never even saw it, it looks quite tasty. Click on the image to see the larger, readable version. April 27, 1941: Judy appeared on the “Young America Wants To Help” radio show, and sang “Chin Up, Cheerio, Carry On” from the upcoming film Babes on Broadway. The show was broadcast to England over three networks, Mutual (in the U.S.), the Canadian Broadcasting Corporation, and the British Broadcasting Company. The event was arranged by the Radio Divison of the British War Relief Society and was timed to take place while London radio audiences were in their air raid shelters. The show originated in New York with “cut-ins” from Hollywood. Judy was joined by Helen Hayes who provided the greetings to Young Britain on behalf of Young America, Gertrude Lawrence, the Yale University Glee Club (noted as having 50 voices), New York Mayor LaGuardia, and the Youth Orchestra of the New York City High School of Music and Art which was promoted as a 100 piece orchestra of all youths conducted by Leopold Stokowski. To top it all off, the future Queen of England, Princess Elizabeth, and her sister, Princess Margaret Rose, read messages. April 27, 1949: Filming began on the “I’m An Indian, Too” number for Annie Get Your Gun. Judy had a 9 a.m. call, due on set at 10:30 a.m.; she arrived on time; lunch: 12:45-1:45 p.m.; time dismissed: 5:30 p.m. Filming would continue through May 2nd. Director Busby Berkeley was replaced by Charles Walters on May 5th. Judy was removed from the project on May 10th. 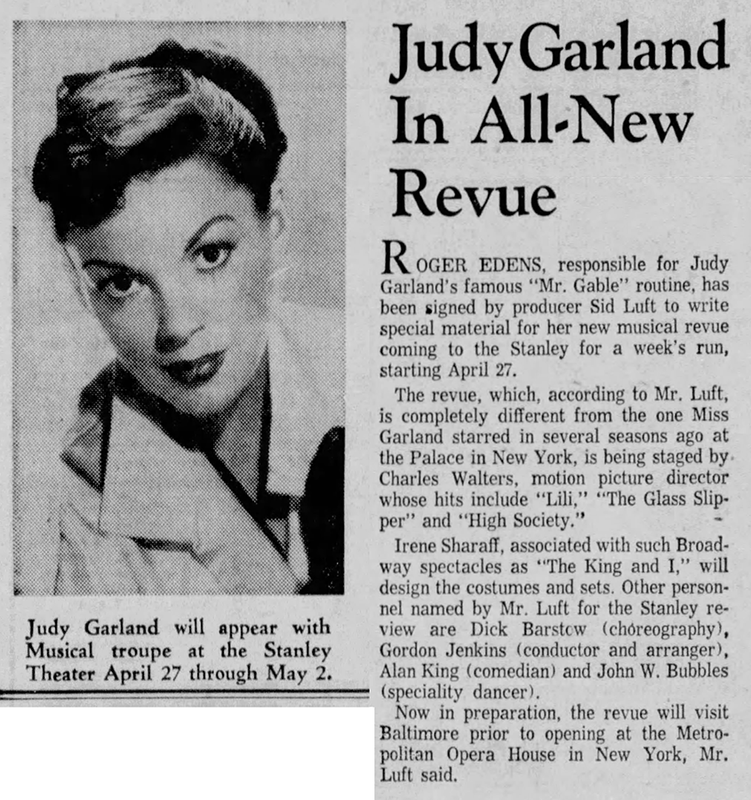 April 27, 1959: Judy opened at the 2,800 seat Stanley Opera House in Baltimore, Maryland. This was a “tryout” engagement for Judy’s new production which would play the famous opera houses across the country. Judy grossed $65,000 playing to capacity crowds for four of the six nights; the weakest nights were Tuesday, because of rain, and Friday, because the weekend tickets went up to a high price of $6.50, “a pretty high tag in these parts,” according to one report. 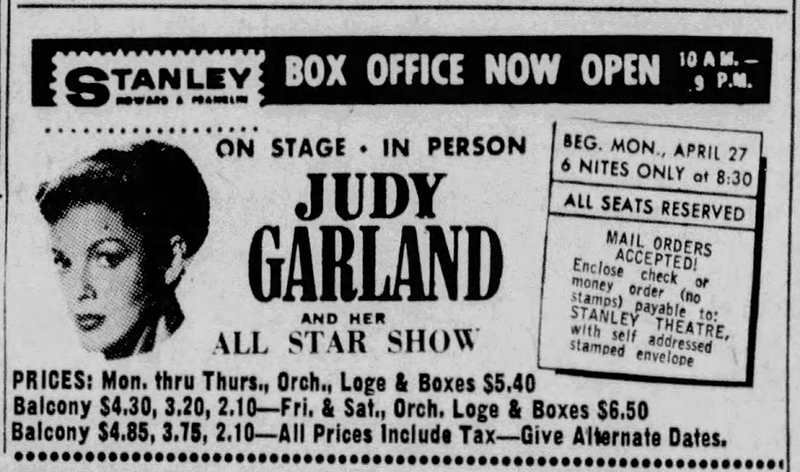 The reviews of the show were raves, except for some disappointment over Judy lip-syncing to a prerecorded taped vocal of “Born In A Trunk.” The reason for the prerecording was that the blocking of the number, which was changed so Judy could sing it live. VAUDEVILLE came back to Baltimore last night, and a near-capacity audience at the Stanley welcomed it like an old friend. An air of nostalgia pervaded the auditorium as Judy Garland, heading a cast said to number 100, sang song after song from the list of hits which, over the past twenty years, have made her one of the nation’s top recording and motion picture stars. Every time she swung into one of the familiar favorites – say, “Over the Rainbow” or “You Made Me Love You” – the beaming spectators, some 2,700 strong, according to the management, burst into spontaneous applause. Truly, she could have done anything and, so warm was the feeling of affection for her, they would have loved it, which was fortunate – for, with the exception of that provided for the long monologue of comic Alan King, the material generally was disappointing. It may be that the roughness always characterizing a first performance before an audience was responsible for much of the insubstantial effect of the revue; on the other hand, it may be that Roger Edens, who put together most of the scenes, is depending too much on Miss Garland to make a show sorely lacking in originality seem fresh and new. An early decline forced me to leave before the finale but, judging by the eleven (out of a total of fourteen) numbers I saw, the tissue connecting Miss Garland’s various medleys of old songs is so slight that it might as well have been left out altogether. I can, in fact, recall only one real production number – a dramatized flashback of the singer’s career from a child performer to the present – and, for some strange reason, the voices during this sequence seem to have been recorded on a soundtrack with the people on stage merely pretending to sing. This not only introduces an air of strangeness into the proceedings but utterly destroys the spontaneity essential for such a number’s success. The audience, whoever, didn’t seem to mind this slight deviation one bit. Evidently Judy’s voice – whether on wax, tape or public address system – was enough for them. It is a rich and exciting voice, capable – when its owner really lets loose – of shooting prickles up the spine of even the most prosaic reviewer. 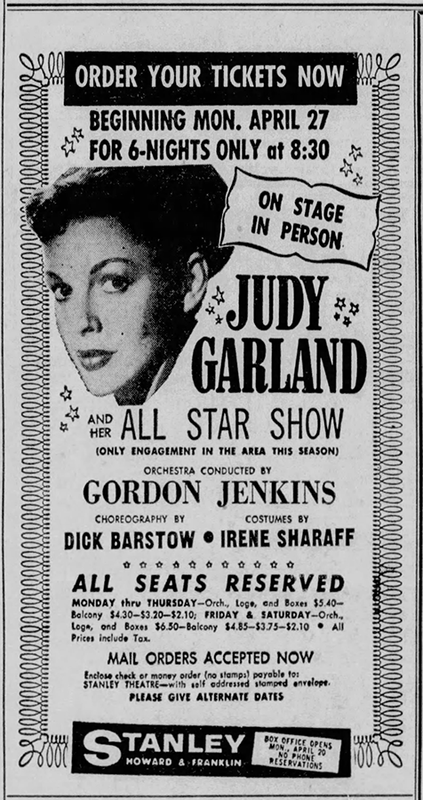 A noticeable nervousness subdues some of Miss Garland’s natural ebullience during the first part of the show, but she seemed to grow more and more assured with each number so that toward the end of the first act she was knocking them out with that wonderful fervor and confidence we all associate with her personality and style of singing. Mr. King, who has just returned from a successful engagement at various London theaters, is sort of a belligerent Sam Levinson. He is younger than the well known Jewish comedian, but he uses the same themes – namely, the family of how awfully funny being a member of one is. Starting with a series of man-and-wife jokes (“When we married, my family had more money than hers, and we were on relief”), Mr. King, who looks a little like the late Mike Todd, switched his satiric attention to his mother-in-law, his children, his neighbors and even his work. “I have a very peculiar kind of act,” he declared, after talking for about fifteen minutes. “I don’t have a finish. I don’t have an opening either,” he added as a second thought, “and actually I’m not too crazy about the middle.” Judging by the audience’s continuous and almost hysterical laughter, Mr. King was the only one in the house who felt this way. Both “The Letter” and “I Happen to Like New York” were composed by Gordon Jenkins who arranged all the music for the review last night conducted the orchestra. Richard Barstow is responsible for the choreography, of which there is little in the show, and Irene Sharoff [sic] designed the sets and costumes. 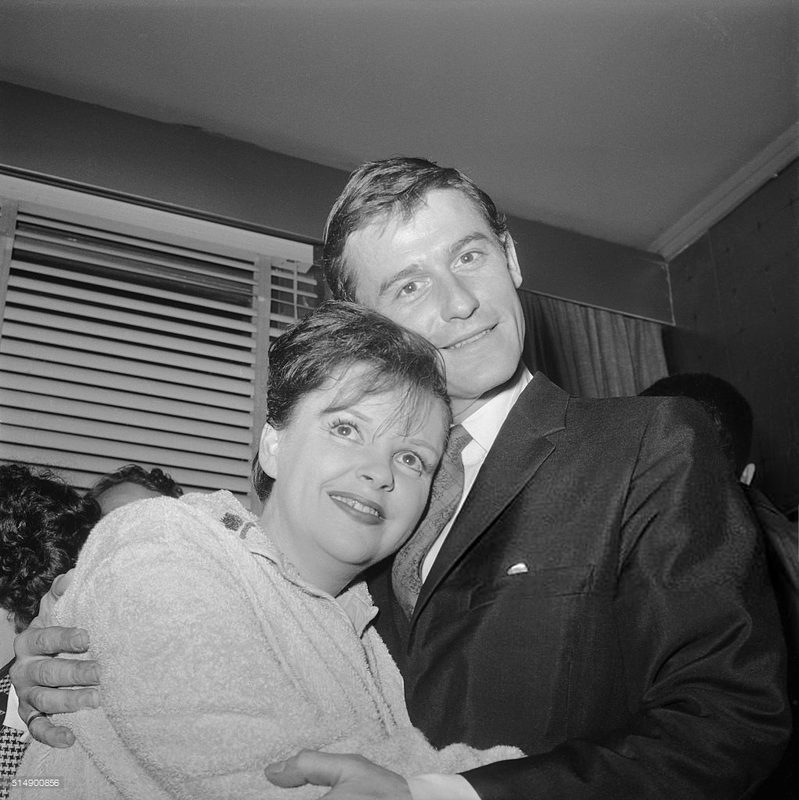 April 27, 1961: This photo of Judy and Roddy McDowell backstage after her triumph at Carnegie Hall was published in various papers on this day and for several days after.